An exclusive single malt from Gordon & MacPhail’s Generations range is the only whisky to be shortlisted in this year’s Scotland Food and Drink Excellence Awards. The Gordon & MacPhail Generations Glenlivet 70 Years Old has been shortlisted in the Drinks category of the awards. The Glenlivet 70 Years Old was released by Gordon & MacPhail in 2011 as an addition to its “Generations” range. 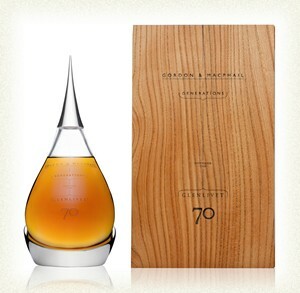 It is the second 70 year old single malt to be released by Gordon & MacPhail. This cask of The Glenlivet was laid down on 3rd February 1940, on the instruction of John Urquhart, grandfather and great-grandfather of company’s current owners. Since then, successive generations of the Urquhart family waited for the day when it would be ready to share with fellow whisky lovers. 70 years on, the whisky was bottled at cask strength (45.9%). David Urquhart, joint managing director of Gordon & MacPhail, commented: “This nomination is recognition of the Glenlivet 70 Years Old’s superb quality, luxury and its rarity. A limited number of bottles were released by Gordon & MacPhail in 2011. Only 100 70cl decanters were released, selling in the UK at £13,000. The smaller, 20cl decanter sold at £3,500 in the UK. All large decanters have been sold to countries throughout the world including Japan, Taiwan, France, UK and USA.